The standard red variety is Red Lake. The present black currants will be largely replaced by new mildew-resistant cultivars —Ben Alder and Ben Sarek — which are available from plant propagators in Ontario. They're an excellent source of Vitamin C and also contain fibre and iron. Currant seeds have been found in prehistoric Danish sites. 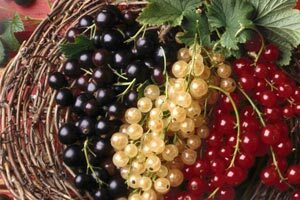 It's speculated that the Vikings may not have named their Newfoundland settlement, Vineland, after grapes, but for the wild currants found there. Currants were first domesticated in Scandinavia, around 1600. The cultivated varieties came to North America after taking root in England. Berries should be firm, bright in colour and shiny. They can be refrigerated for a few days after picking (red currants usually last longer than the blacks). Rinse off and gently remove stems. You can mix currants with other fruits for salads or use them in pies, tarts and muffins, or to make a tangy jam. You can also serve them stewed, as a condiment with roasted meats. The French use the black currants to make the liqueur cassis. Stem. Pack without sugar or syrup. Place on tray and freeze until firm. Pack in freezer bag.